Dr. Liliana Marcu Awan MD is fluent in English, Spanish, and Romanian. She is a Board Certified Family Physician. She did her undergraduate studies at University of Denver where she received her Bachelor’s Degree in Biology. Following her undergraduate studies Dr. Liliana Marcu Awan MD obtained her medical school MD degree from UNIBE. Initially she did a year of residency in Psychiatry at Temple University in Philadelphia. She then completed her residency in Family Practice at Virtua Hospital in New Jersey, where she served as Chief Resident. She then moved to Florida in 2007 and started her Family Practice here in Hollywood where she continues to practice at Medical Center of Hollywood- Family, Cosmetic, and Ketamine Infusion Center. Dr. Liliana Marcu Awan MD is affiliated with Memorial Regional Hospital, Memorial Hospital South, and Memorial Hospital Pembroke where she serves as Chief of Medicine. Here she was also Director of New Vision, a medical stabilization, inpatient center for polysubstance abuse at Memorial Pembroke. She is certified by the AAAP/SAMSHA in polysubstance abuse detoxification. 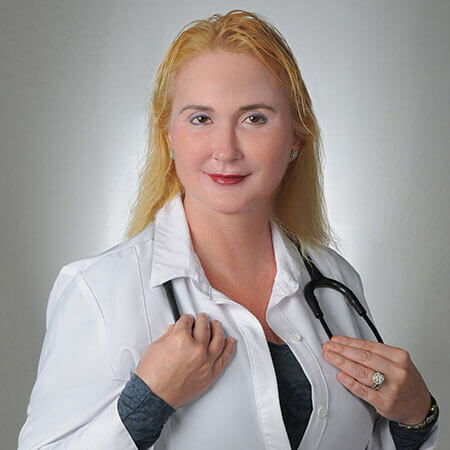 Dr. Liliana Marcu Awan MD has also achieved a title of Fellow of American Academy of Family Physicians (FAAFP), a standard achieved by the highest quality of family physicians in the United States. She is also a member of the American Academy of Family Physicians. In addition, she achieved certification in aesthetics/cosmetics by the American Academy of Family Physicians.